CLEAN TITLE CERTIFIED! Reviews: * Sophisticated ride quality; room for five and their stuff; quality cabin materials; efficient base engine; powerful Sport model; many available technology features. Source: Edmunds * The all new 2015 Ford Edge is taking crossovers to a whole new level. The SE, SEL, and Titanium models offer both the remarkable 2.0L EcoBoost engine gives you plenty of low-end torque for acceleration and passing, and the 3.5L Ti-VCT V6 for best in class power. The bold Edge Sport model makes use of a fiery 2.7L V6 EcoBoost engine to deliver tons of torque and power. A new SEL Appearance Package adds flair including eye-catching 20 inch wheels. Available in all-wheel drive or front-wheel drive, the Edge can help you maintain your cruising distance, change lanes and back out of parking spaces. The turbocharged, direct-injection 2.0L EcoBoost I-4 engine with 6-speed automatic transmission, helps the Edge deliver up to 30mpg hwy. Outside, aggressive front and rear fascias combine with a bold black grille, unique headlamp treatments, oval-shaped chrome exhaust tips and jaw-dropping 18-20inch alloy wheels to give any Edge the look that backs it all up. 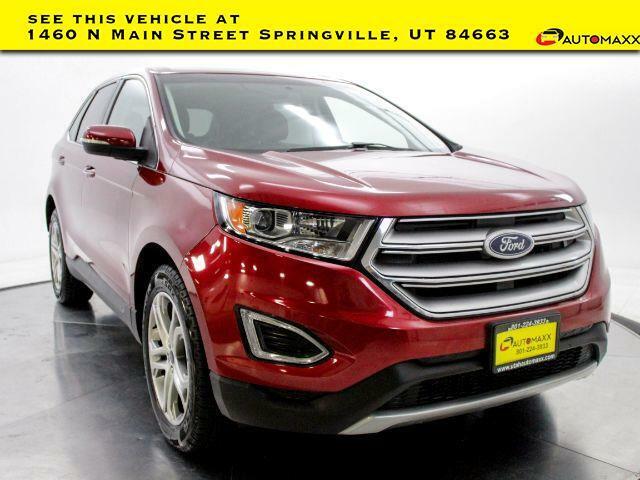 2015 Ford Edge Titanium Awards: * 2015 IIHS Top Safety Pick * 2015 KBB.com Brand Image Awards --- www.utahautomaxx.com --- 801-489-0500 . All vehicles include a 1 year warranty!